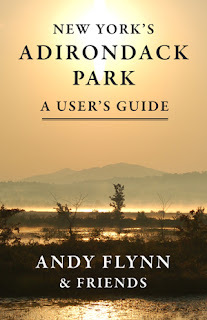 Hungry Bear Publishing recently released the print version of “New York's Adirondack Park: A User’s Guide,” by Andy Flynn & Friends, which answers the question – “What is the Adirondack Park?” A Kindle version was released on Amazon.com in February 2013. With information from the Adirondack Park’s leading government, not-for-profit and historical organizations, the “User’s Guide” gives the public – residents and visitors – a valuable reference guide that helps them safely and responsibly use the state-owned Forest Preserve. It gives them informational links to community assets, such as attractions, special events, communications, transportation, tourism organizations, and recreational opportunities. There are also helpful tips on using the Forest Preserve, hiking, camping, fishing, horseback riding, bicycling and more. Officials from the New York State Department of Environmental Conservation (DEC) and APA contributed to this book, along with members of the Adirondack Forest Preserve Education Partnership: the DEC, Adirondack Regional Tourism Council, Adirondack Mountain Club, Wildlife Conservation Society, Adirondack Park Invasive Plant Program, and Leading Edge. “We should pass a law: I really think this book should be included with the deed when people buy property in the Park,” said Kimberly Rielly, director of communications, Lake Placid CVB/Regional Office of Sustainable Tourism. The book includes 13 of Flynn’s stories from the “Adirondack Attic,” straight from the archives of the Adirondack Museum, to help illustrate the “how-to” aspects of using the Forest Preserve and give a much-needed historical perspective. The stories also humanize the 6-million-acre Adirondack Park, since it’s the communities that make this place so unique. 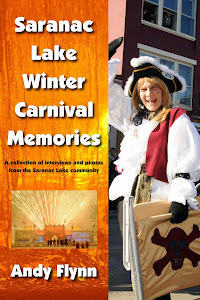 Andy Flynn is an author, publisher and award-winning newspaper editor living in Saranac Lake. In his spare time, he operates Hungry Bear Publishing with his wife, Dawn. During the day, he is the assistant managing editor at Denton Publications in Elizabethtown and editor of the North Creek News Enterprise. Flynn is a graduate of the Tupper Lake High School and SUNY Fredonia, where he received a bachelor’s degree in communication. “New York’s Adirondack Park: A User’s Guide” is 96 pages and retails for $8.95. 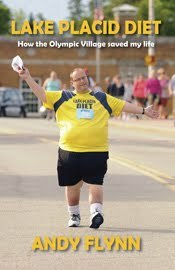 It is available in Adirondack bookstores, at Amazon.com and online at www.hungrybearpublishing.com. 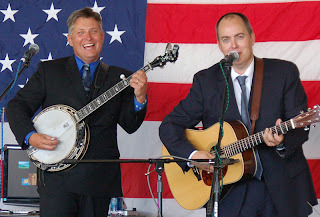 This book will explore the lives of Eric and Leigh Gibson from farm life in upstate New York to success on the international bluegrass stage. This early biography documents the Gibson Brothers shortly after they were named the 2012 IBMA Entertainers of the Year. It’s a critical time in their careers, as they try to stay on top of the charts with a new album – “They Called It Music” – and focus on the music while dealing with music business challenges. Both in their early 40s, Eric and Leigh are reaping the benefits of 30 years playing together. Author Andy Flynn is working with the Gibson Brothers to produce an accurate, honest and compelling biography. He will be interviewing the band on tour and at home in the off season to get a unique behind-the-scenes view of what it takes to become a bluegrass music star. “We’re not as big as you think we are,” Leigh said in April 2013, showing that the brothers remain grounded as their stars shine brighter every day. The book will tell stories about Eric and Leigh Gibson, home life, the band, life on the road, making the music, and earning awards. And there will be plenty of pictures. The project started in May 2013 and is expected to take a couple of years to complete. To receive updates on the progress of this book, please send your name and email address to Andy Flynn at adkhungrybear@yahoo.com. Hungry Bear Publishing Feb. 17 released an eBook on Amazon.com’s Kindle platform titled “New York’s Adirondack Park: A User’s Guide,” by local author Andy Flynn and friends from the Adirondack Forest Preserve Education Partnership (AFPEP). Using the Adirondack Park’s leading government, not-for-profit and historical organizations, the “User’s Guide” gives the public — residents and visitors — a valuable reference guide from respected sources that helps them responsibly use the Forest Preserve while giving them informational links to community assets, such as attractions, special events, communications, transportation, tourism organizations, and recreational opportunities. There are also helpful tips on using the Forest Preserve, hiking, camping, fishing, horseback riding, bicycling and more. The book includes 13 of Flynn’s stories from the “Adirondack Attic” book series, straight from the archives of the Adirondack Museum, to help illustrate the “how-to” aspects of using the Forest Preserve and give a historical perspective. In addition to Flynn’s stories, officials from the New York State Adirondack Park Agency and Department of Environmental Conservation contributed to this book, along with members of the Adirondack Forest Preserve Education Partnership: the DEC, Adirondack Regional Tourism Council, Adirondack Mountain Club, Wildlife Conservation Society, Adirondack Park Invasive Plant Program, and Leading Edge. "It takes a lifetime to really understand the Adirondacks – the people, the zoning, the wilderness ... the everything – but this is an excellent primer,” said George DeChant, board member of the Indian Lake Chamber of Commerce. “With all the links, phone numbers and addresses, you will have enough information to spend a lifetime learning the nooks and crannies of all that is inside the Blue Line." The eBook is available for $6.99 on the Kindle platform at www.amazon.com. The “User’s Guide” includes convenient hyperlinks to the many organizations, attractions, and services throughout the Park. It includes more than 50 color images and can be read on a variety of electronic devices, including PC, Mac, Kindle, Kindle Fire, Kindle Fire HD, iPad and iPhone with the Kindle Reading App, a free download. “We should pass a law: I really think this book should be included with the deed when people buy property in the Park,” said Kimberly Rielly, director of communications for the Lake Placid CVB/Regional Office of Sustainable Tourism. A print version of the book is expected to be released in the summer of 2013.